I'm a big fan of Aromatherapy Associates products. They're high quality, full of essential oils and smell divine. Their new Inner Strength bath and shower oil* is no different. The oil was created by co-founder Geraldine Howard whilst she was receiving cancer treatment. She wanted to create something that would give her strength and courage, plus encourage a positive frame of mind, which would help her through the difficult time. The oil contains clary sage, frankincense and cardamom and really does have an uplifting scent to it. 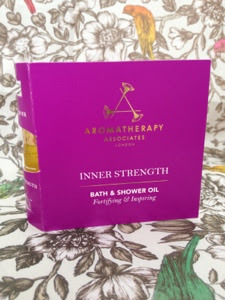 Like all other Aromatherapy Associates oils I've tried, this one fragranced the whole bathroom, leaving it smelling wonderful. It's also not a greasy oil. I'm left with lovely soft skin after my bath, but I don't feel 'slippy' at all. 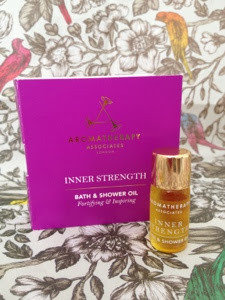 Inner Strength retails for £39 for 55ml, which is enough for approximately 20 uses. It is a luxury product at a high price, but I think it's worth it for a special bath treat. Additionally, 10% of proceeds from the Inner Strength oil are going to the Defence Against Cancer foundation, who are helping to develop a pioneering cancer vaccination. Have you tried any Aromatherapy Associates bath oils before?